Nolan is going through a growth spurt right now, which means practically all he wanted to do on Friday was sleep and eat. I had some groceries delivered in the afternoon, and had been hoping for a good fish selection, but no dice. I ended up settling on some bay scallops, and was thrilled when the little guy ended up sleeping long enough for me to whip up a scallop and porcini risotto for dinner. Our risotto was a slightly adapted version of a Food and Wine recipe: I included only dried porcinis and bay scallops (lacking shrimp and fresh mushrooms). I used Better Than Bouillion clam base in rather than bottled clam juice, and reduced the amount to a single cup. The result was a very filling, savory meal, and the bay scallops in this context were decidedly less stressful to cook than seared sea scallops—which I always worry about turning into rubber balls. In a small bowl, soak the porcinis in the boiling water until softened, about 15 minutes. Remove the mushrooms and strain their liquid into a medium saucepan through a sieve lined with a paper towel. Rinse the mushrooms well to remove any remaining grit and chop them. Add the broth, water and clam base to the mushroom-soaking liquid and bring to a simmer. In a large pot, heat the oil and butter over moderately low heat. Add the onion and cook, stirring occasionally, until translucent, about 5 minutes. Add the garlic and rice and stir until the rice begins to turn opaque, about 2 minutes. Add the wine and salt and cook, stirring, until the wine has been absorbed. Stir in the dried mushrooms and 1/2 cup of the simmering stock; cook, stirring frequently, until the stock has been absorbed. The rice and the stock should bubble gently; adjust the heat as needed. Continue cooking the rice, adding the stock a ladleful at a time and allowing the rice to absorb the stock before adding the next ladleful. Cook the rice until almost tender, about 25 minutes, and then add the scallops. Cook, stirring, until the rice is tender and the scallops are done, about 5 minutes longer. 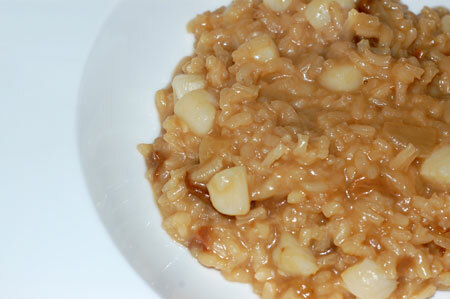 The risotto should achieve a thick, creamy consistency, and you may not need to use all of the liquid.